Frank Stronach, left, built Magna into the international corporation it has become after leaving Austria for Canada as a penniless 21-year-old tool maker in 1954. 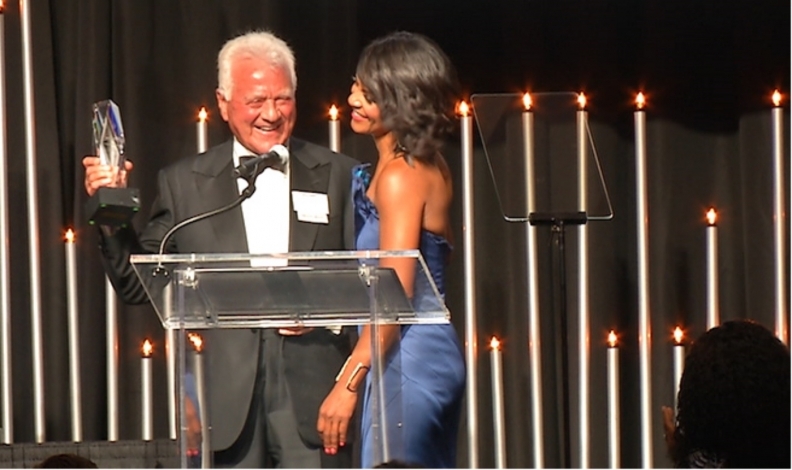 Frank Stronach, founder of supplier giant Magna International was officially inducted into the Automotive Hall of Fame at a ceremony Thursday night in Detroit. Stronach turned a one-man tool shop in Toronto called Multimatic into Magna, the third-largest automotive supplier in the world. "His innovation in creating a unique corporate culture and compensation system, driving competition and excellence, has changed the global landscape of the automotive supply base," a statement announcing the inductees earlier this year said. Stronach built Magna into the international corporation it has become after leaving Austria for Canada as a penniless 21-year-old tool maker in 1954. He delivered his first parts to General Motors Co. and went on to build the company into a global parts giant. Stronach told the audience it was a great honour to be recognized by his peers. He then thanked his team of directors, executives, engineers and employees who helped build Magna over the years. Stronach stepped down as chairman of the auto parts company in May 2011. Magna is now ranked third on the most the recent Automotive News Top 100 Global Suppliers List — its third consecutive year in that spot — and is the only Canadian company in the top five. It did $38.94 billion (all figures in USD) in total global OEM automotive parts sales in 2017, up more than $2.5 billion from 2016. Magna was also the top supplier to North America, with $21 billion in sales. Ray and Tom Magliozzi, co-hosts of the National Public Radio weekly show "Car Talk."